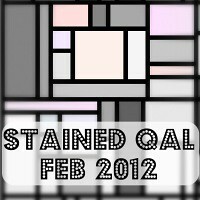 April is my month in the Modern Stitching Bee and I've been really looking forward to this one. 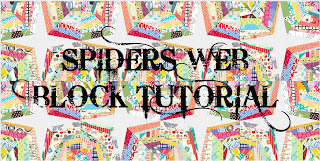 This is it, this is the time, the time is now, big girl pants at the ready, I want SPIDERS WEB BLOCKS!! I have been so daunted by these for so long, but so completely enamoured too. Many, many hours spent looking for the right tutorial online; loads of great tutes but I can be a right fussy bugger and I didnt manage to come up with anything that covered exactly what I want all in one. Only thing for it was to do my own. It took me 7 hours over all, from nothing to pattern, photos for tutorial and finished block. I really wanted a 12" finished size block. This was just coming in shy of 11 and 3/4 unfinished... just. I stomped off to bed in a right huff! and it gave me enough of a laugh to get stuck in to ... well, to be honest I got stuck into helping Mum have a go at drawing the pattern pieces with me! I'm afraid to say I was just too tired and too bad tempered to have managed to do it without mums positive outlook and her laid back.... well, to be honest she swore a bit too! (sorry mum but you did, just a little...) Between the two of us eventually we got it sorted and I was able to reuse the duff block too, so yay! Tutorial done! CLICK HERE or look at the top tabs for pages! I'm going with Kona Ash centres, and the webs themselves to be bright, but light - ie no batik, no dark, no massively busy heavy prints - with some texty fabrics, and some selvages thrown in too. I am asking for wonky strips, none thicker than an inch (averaging 7+ strips per side) I am also asking my bee mates to make one strip, just one in the whole entire block, a light bright solid. If they all do this and place it next to the grey (spot the pink one on my block below!) I will stamp their name on it myself and there wont be any need for a signature block. I must say, block one was certainly a labour of love. And I do you know, I love it! Block two will be a breeze now. I hope you have a nosey at the tute, and if any of you actually use it and make a block or two I'd love to hear about it. In fact, what the hell, I could do with a couple more blocks to get a nice big bed quilt, so if anyone would like to contribute one...... drop me a line and we can discuss maybe an exchange of some kind! You and I must be on the same wavelength. A block just like this is on my short list for one or other of my bee blocks. I'll certainly give it a go - well, I've got nothing else to do have I!! I am so excited about this. I have sooooooo many strips and a few (hehehehe) selvages. These are going to be fun. I can't wait!!! 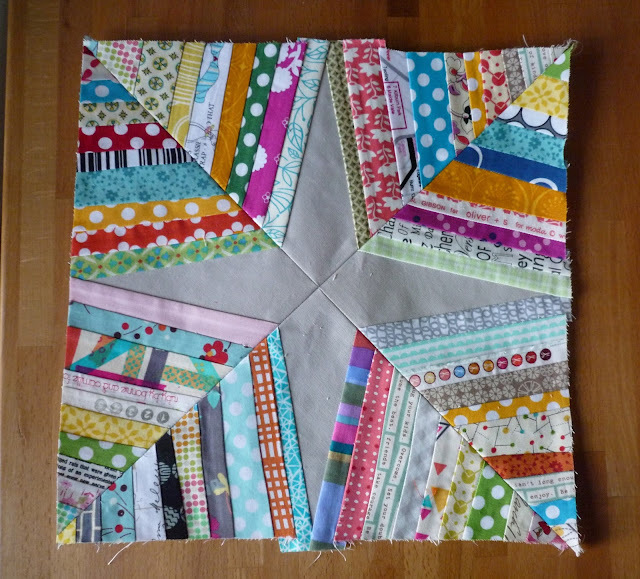 I love your block and your tutorial (it's marvellous!) - your quilt is going to be wonderful! Well you know you will be getting two from me seeing as how I am in the bee. I am off to Mum's for a week though so it will have to be in the latter part of the month - sorry! Your block looks fab though! Well done for persevering and love the sound of your mum :) If I have some Kona Ash, I shall happily make you one but not sure if I do. I shall have a look. Super tute - this one may come back at you - wonder what 24" blocks would look like!!? Ah, spiderwebs. 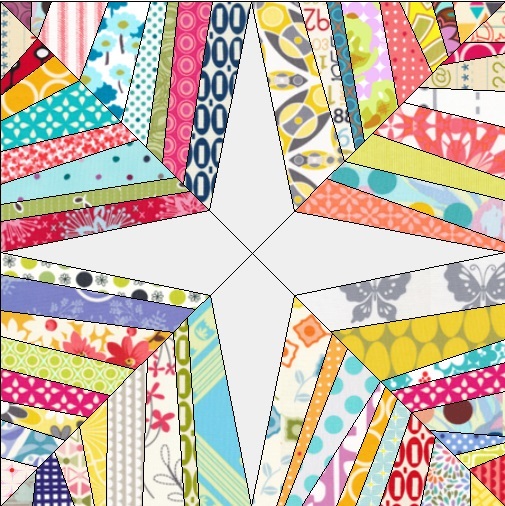 I spent a happy Sunday morning staring a spider web quilt with all my Aneela leftovers....that was at least 2 months ago and I still only have one block ;-) will get an order in for some kona ash and make yours up, 2 seems much more doable than 39 odd....my quilt will have to wait! I have some selvages saved and now I need to figure out fabrics, but I can do it. At least I hope so. I'd love to try it and if it turns out nice I'll send it to you, OK? It looks brilliant Sarah! Well done to you and your Mum! Ooh love a bit of strip piecing! Fab, well done mum for coming to join the team, and well done both for the result! Looks great! I'm a bit confused though. What did your Mum spot that helped you resize and caused a giggle? I can't pick anything in the photo? Could be me being thick! I am SO excited to give this a try. You and your mum crack me up :) Your finished tute is wonderful, so our blocks will surely be the right size...Here's hoping! Love this! I'll definitely be trying your tutorial sometime! A gorgeous block! My readers at FaveQuilts would love this.